A serious medical diagnosis deserves a second opinion. Sustainability reporting is no different. Reporting standards like GRESB, CDP and GRI each have strengths and weakness so it's good to keep their diagnosis of your performance in context by having a second or third opinion. Remember, some reporting standards, like CDP, can be used by any type of organization but address a narrow set of environmental impacts. Others cater to specific industries, like GRESB. While there's often overlap of information collected by each standard, there are also considerable differences which means it's possible to perform well on one and poorly on the next. For this reason, reporting to multiple standards is not just a way to show your sustainability chops but a way to calibrate how well you're actually performing relative to your peers. It's also useful to hedge your performance so your investors and stakeholders can see it in a broader context. Let's look into the differences between CDP and GRESB so you can get a balanced opinion of your performance. Are CDP and GRI useful for real estate companies? GRESB is just one opinion in a marketplace filled with groups anxious to tell you how you stack up. Our blog on the Top 5 Sustainability Frameworks takes a deeper dive into this crowded landscape. For now, just know that real estate companies were reporting to CDP and GRI long before GRESB. Today, leading companies like HCP, Prologis and General Growth Properties report to all three. Why should I report to CDP? 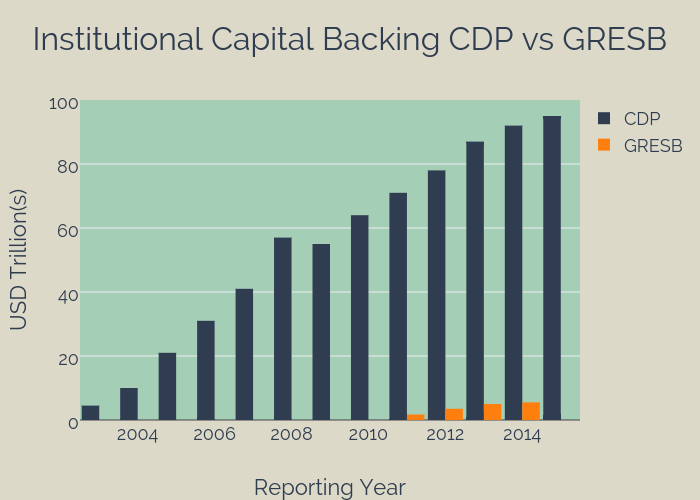 CDP is the world's largest and most prominent investor-backed sustainability reporting standard, dwarfing GRESB with its more than 800 investors representing US $95 trillion in assets. That's 50 times the investor capital behind GRESB. So if you're looking for a larger audience, CDP is the way to go. As a real estate standard, GRESB is most concerned with building-level performance data. CDP, on the other hand, provides a broader view of sustainability performance that includes many aspects of your company such as buildings, corporate travel and supply chain, not just the performance of your real estate investments. A look at the difference in reporting scopes for CDP and GRESB. How do I report to CDP? Adding CDP to your Measurabl account is simple. Just click on "add report" on your Home Page and select CDP. Just like with GRESB, Measurabl does all the complicated math and guides you through the report step by step. All you need to do is complete as much of the survey as possible. We take care of the rest. CDP is driven off much of the same data as GRESB: energy, carbon, and water from your owned buildings. But you have the opportunity to round out your CDP report by including your corporate offices, travel and vehicles. As always, Measurabl will collect this data and prepare and submit your report for you. With both CDP and GRESB in your back pocket you'll not only have a more comprehensive sustainability reporting program, you'll have a more comprehensive assessment of your overall sustainability performance.